Solar Power Systems are modular in design, which means that they're easy to install, require little to no maintenance and work without any moving parts. 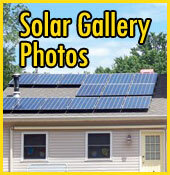 Solar Modules Panels : Are Placed on your roof or can be configured as a ground mount, the modules collect sunlight to make DC (Direct Current) Electricity. These panels must have access to sunlight, so one of the first steps of your consultation for your home or business is to determine the best location due to trees or structures that would shade part or all of your solar system. Inverters: Take the DC electricity from the solar panels and then converts it into the AC (Alternate Current) electricity that your home or business uses. 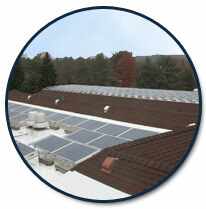 These inverters are tied directly to your electrical panel. 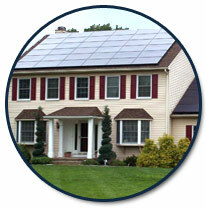 Your inverter will tell you how much power is being produced by your solar energy system. Utility Meter: If generate more power than you use, the excess electricity flows through the meter back to the utility company as a credit to your account, thus spinning your meter backwards. There are times, at night for instance, when you use more than your system is producing, it will still pull electricity from the utility company through your meter. The solar cells that you see on calculators and satellites are also called Photovoltaic (PV) cells, which as the name implies (photo meaning "light" and voltaic meaning "electricity"), convert sunlight directly into electricity. And they’re everywhere. They power everything from pocket calculators to satellites that orbit Earth, to an ever increasing number of homes and businesses. 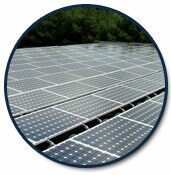 A module is a group of PV cells connected electrically and packaged into a frame (more commonly known as a solar panel), which can then be grouped into larger solar arrays. PV cells also all have one or more electric field that acts to force electrons freed by light absorption to flow in a certain direction. This flow of electrons is a current, and by placing metal contacts on the top and bottom of the PV cell, we can draw that current off for external use. This current, together with the cell's voltage (which is a result of its built-in electric field or fields), defines the power (or wattage) that the solar cell can produce.